I just returned from my very first Haven Conference and it was amazing. I am exhausted, like that feeling you had when you were little and came home from summer camp. It’s a high-energy event full of networking, sharing, smiling, meeting new people and packed with lots of good information to help bloggers learn more about how to best represent themselves to their readers. 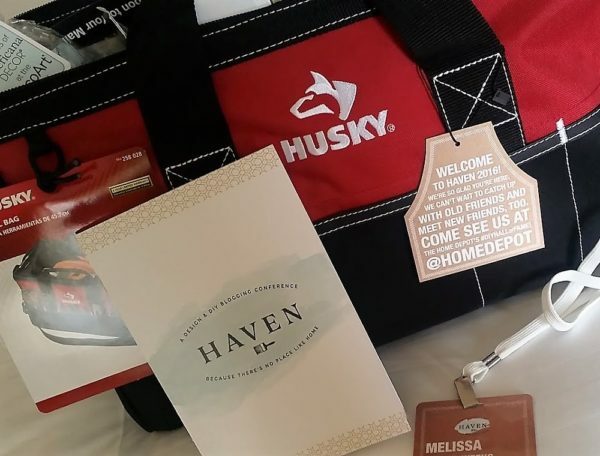 Haven Swag Bag — totally full of good stuff! Packed full of DIY supplies like a Dremel rotary tool, paint brushes, tape, glue, a fun hot pink bag full of tools, craft supplies, thermos mugs, notepads, pencils, tape measures. This was just the beginning. 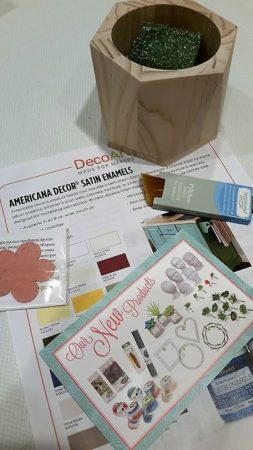 The Home Depot, Ryobi, DAP, Frog Tape, Cricut, Schlage, and on and on were so generous with their giveaways. I accumulated more than my suitcase could hold and found a 32 inch TV box in the trash and filled it with all my loot and checked it at the airport. It was opened by TSA at some point because when it came around on the luggage carousel I saw the TSA tape used to re-seal the box. I am sure they said, “this is like the 40th box full of all this stuff, where is it coming from!” A Hodge Podge tshirt was a low threat risk, I’m sure. I met so many bloggers I have followed and admired for years. It was like a celebrity sighting everywhere. 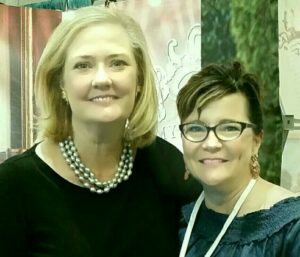 People like Jennifer from Dimples and Tangles, Diane at In My Own Style, Rhoda at Southern Hospitality, and Amy Howard from Amy Howard at Home. I had the opportunity take her painting class and hear her inspiring message of believing in yourself and restoring cast-away furniture. It is amazing to hear that 28 million pieces of furniture are thrown into the trash every year! She has a passion for teaching people how to restore and put new life into something discarded, to inspire people that they, too, can learn a skill and be proud of what they created. I have used Amy Howard at Home paint on several of my own pieces you can read about here. The speakers and workshops were informative and topical. These were led by successful bloggers willing to share their tips and tricks of the trade with new bloggers like me. Social media has totally transformed the blogging world and changes all the time so this information was very helpful. 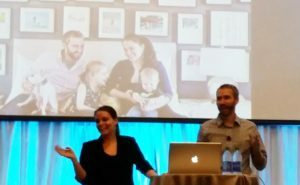 The closing speakers were Sherry and John from Young House Love. They shared an inspiring message to remain true to yourself, be more than your blog, to be creative and take chances, define your purpose and remember why you started blogging. We also had the chance to break into smaller groups facilitated by an experienced blogger. I had the blessing of being partnered with Liz Marie at Liz Marie blog. She was kind, genuine and loved hearing our stories on how we started our blogs. Her husband, Jose, is her partner in her blog and it was fun to get to meet him. It made me realize that next year I might like to take Mr. Bee so he can learn more about the blogging industry. The food and vendor displays were so clever. 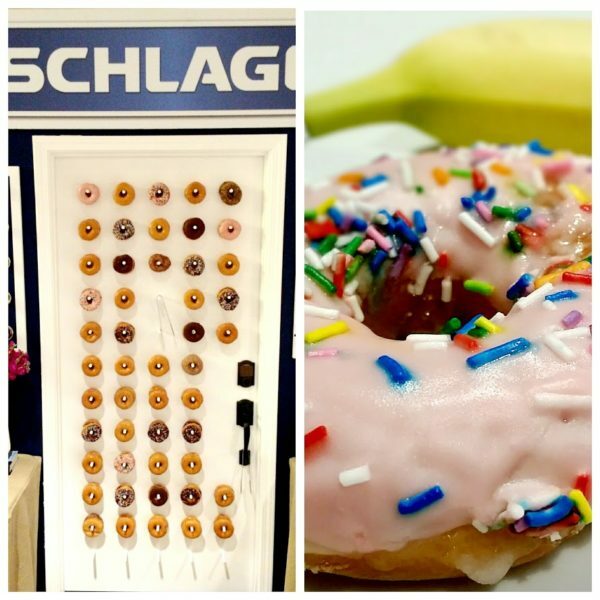 A display by Schage for their locks with donuts! 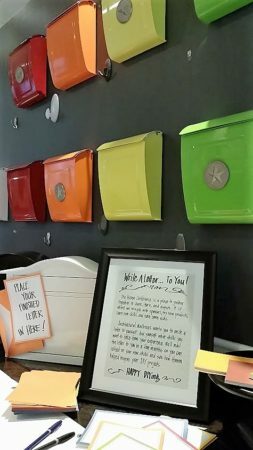 This was the display at the Haven Conference check-in. 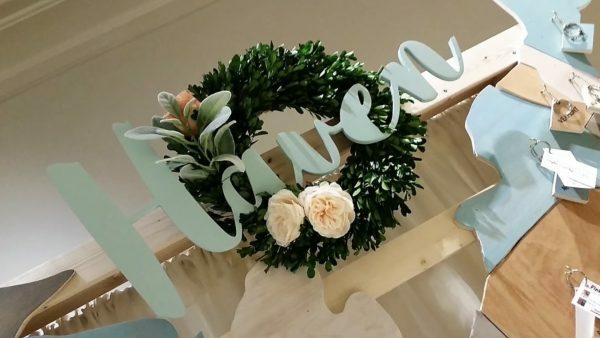 Made entirely of wood by That’s My Letter. Hooks to place your business card for the state you represent. In addition to informational workshops, there were chances to do crafting. I am so glad I did this. At the first part of the conference I told myself I am here to learn about social media and email campaigns I can always do crafts another time. But by Saturday, I was so tired my brain needed some down time. 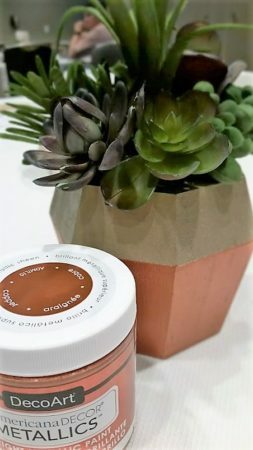 It was so fun to sit with people and paint, and build a succulent vase while listening to music and sipping iced tea. I literally visited the Deco Art table every day to sit and paint. The reps from the table were so nice. And the displays…Home Decorators Collection had their furniture everywhere and it was beautiful. 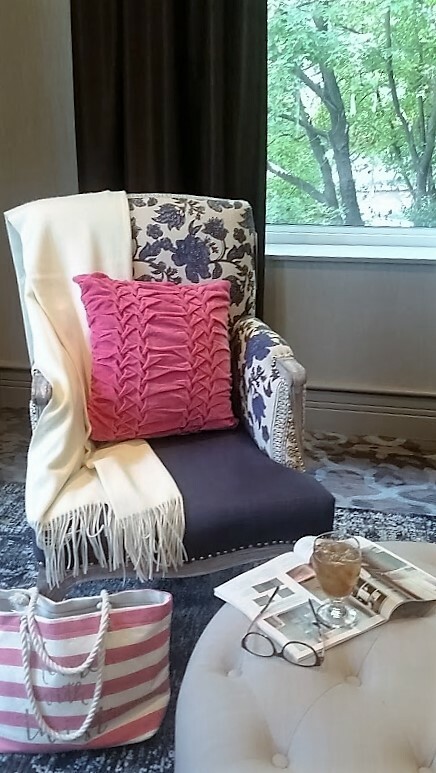 I fell in love with this chair! If I had a way to shove it in that box I checked on the plane, I would have. 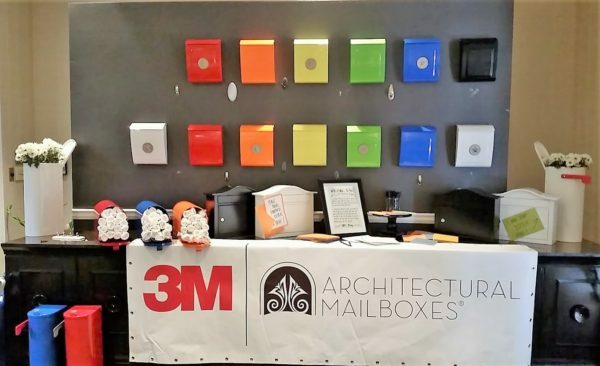 Look at this clever display from 3M. 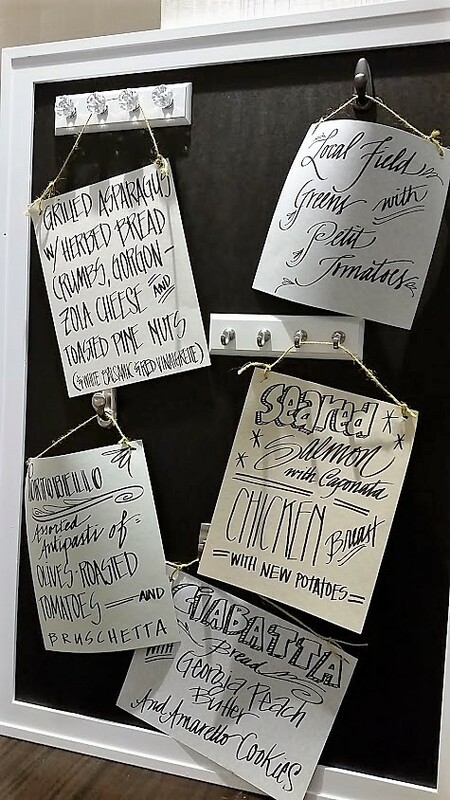 I am thinking of all kinds of ways you could do this for parties — a wedding shower for notes to the bride and groom. Or new parents and you send the notes a few months later as encouragement. Or how about a college send-off party? 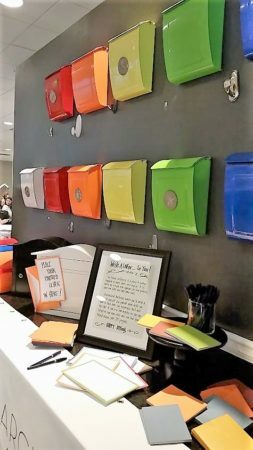 Paint the mail boxes in school colors — wouldn’t that be fun! 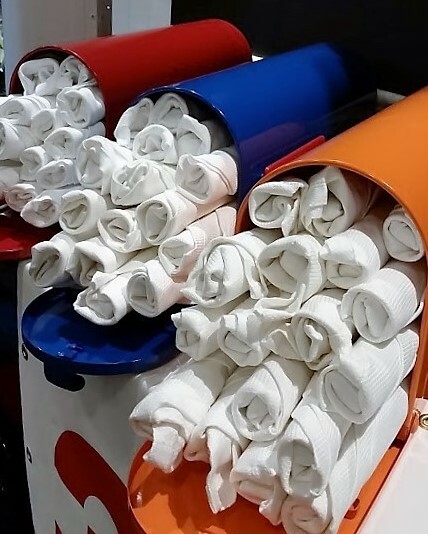 And then there were all the fun touches with the food and beverage service. 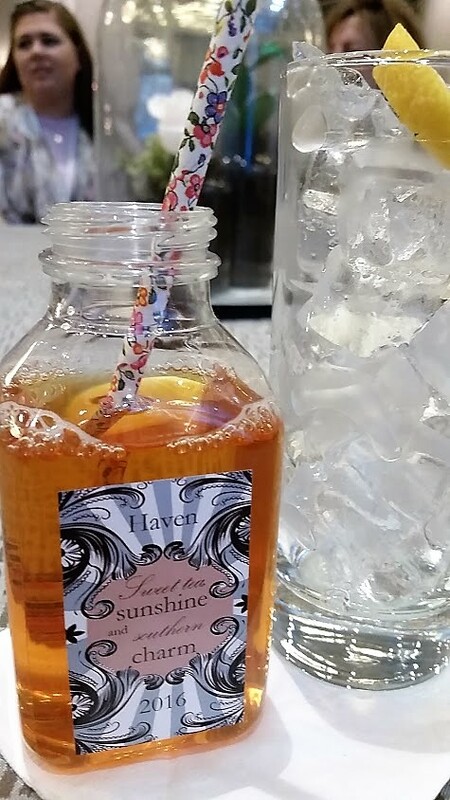 Look at these cute little plastic drink cartons with labels and straws..
And the last thing I made sure to do was take a few hostess gifts for the people I met along the way as a memento from Texas. Some were bloggers I made a point to introduce myself to, others were just sweet people I met sitting next to in a class. 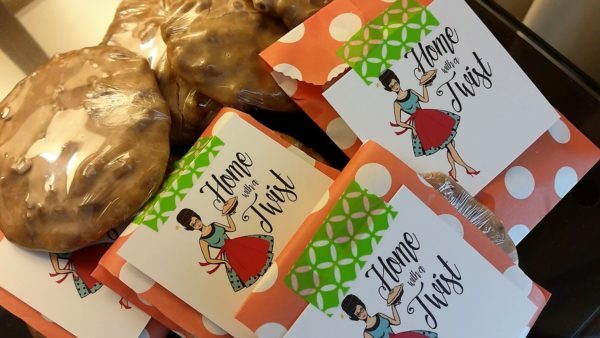 I wrapped up pralines in a polka dot envelope with my business card and kept a few tucked into my bag everyday to hand out. My mother taught me you never go unprepared to say thank you. It was the best conference I have been to in a long while. I really appreciated all the efforts the organizers went to in planning it. I can’t wait for Haven 2017. I just want to hear more! Rhoda? Oh my goodness! Yes, THE Rhoda. She was just like she is on her blog. Warm, beautiful and genuine. I would love to read a series of posts where you go into detail about sessions you attended or more about vendors you liked. That’s a great idea Kathy! I will do that. 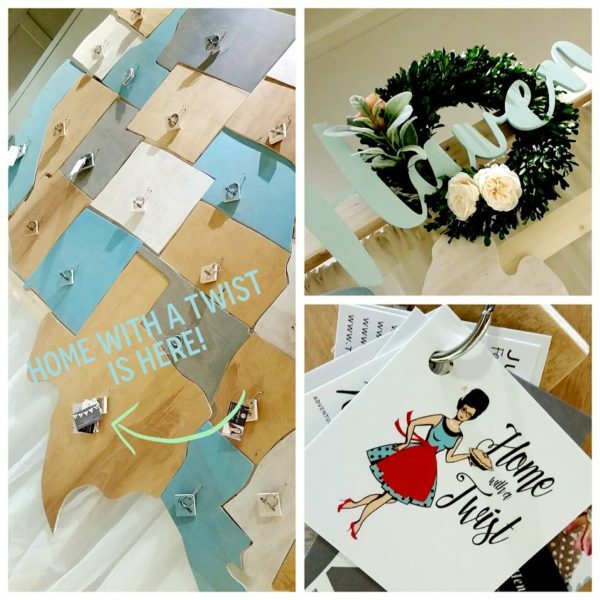 Thanks Melissa for including my giant wood map in your recap. I’m actually at That’s My Letter (www.thatsmyletter.blogspot.com) not The Lettered Cottage although I love Layla to pieces! Great to hear about all the wonderful bits and pieces, it’s overwhelming for certain. Looking forward to 2017. Jaime, I am so sorry for the misprint. I have changed it! It was beautiful for sure. Thanks for reading my post.